An eight-part portrait of animal species in the different biological classes, accompanied by a different style of music. Each animation mixes drawings, pictures, real animals and animated skeletons. A nondescript man is trapped in a sinister flat, where nothing seems to obey the laws of nature. Two magicians, Mr. Schwarzwald and Mr. Edgar, try to outdo each other in performing elaborate magic tricks, leading to a violent ending. Various objects are having a sunny outing together in the nature. A small, animated figure learns how to use a whip, a pair of wings and a house. Two puppets, Punch and Joey, do battle to the death over the custody of a live guinea pig. Stones of different shapes and colors live and die together. Josef shows his friend Frank his garden and his rabbits. Frank is most interested in the unsettling fact that Josef's garden fence is entirely made up of living people holding hands. A man plays the Bach piece of the title on the organ, accompanied by images of stone walls with cracks and holes that grow and shrink, intercut with images of doors and wire-meshed windows. Watch Svankmajer's newer films...save ones like this for last. 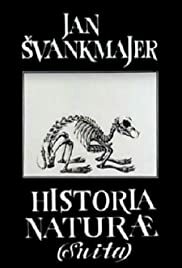 I have seen most of Czech master stop-motion filmmaker Jan Svankmajer's films...."Historia Naturae, Suita" was among the last. I am very glad it wasn't among the very first, otherwise I might never have grown to love Svankmajer's films and given up earlier. It's not a terrible film but the filmmaker simply hadn't mastered his craft and his earliest films are mostly very dry and easy to dismiss. In this one, he goes through the various orders of animals (fish, reptiles, etc.) and does a very fast-paced job of splicing film together of various representations--some of which are stuffed, are skeletons, are alive or are drawings. As it's a 'suite', there's music to accompany all this and I found the music, at times, a bit too frenetic. Not an enjoyable film for me.